Harajuku girl wearing a rainbow dress from Panama Boy with WEGO platform sandals and a WC princess tote bag. Harajuku trio with matching t-shirts paired with jeans, shorts over leggings and torn jeans. Harajuku guy in hat, denim jacket and jeans, layered sweaters, watch, backpack and boots. Blond Harajuku guy with sukajan jacket over sweater and skinny jeans, backpack, sneakers, G-shock watch and necklace. Harajuku rock girl w/ oversized studded Kiss t-shirt, striped sleeves, creepers and hand decorated backpack. Cool Harajuku girl with dip-dye hair wearing a camouflage print parka with a mini skirt, knee length socks and sneakers. 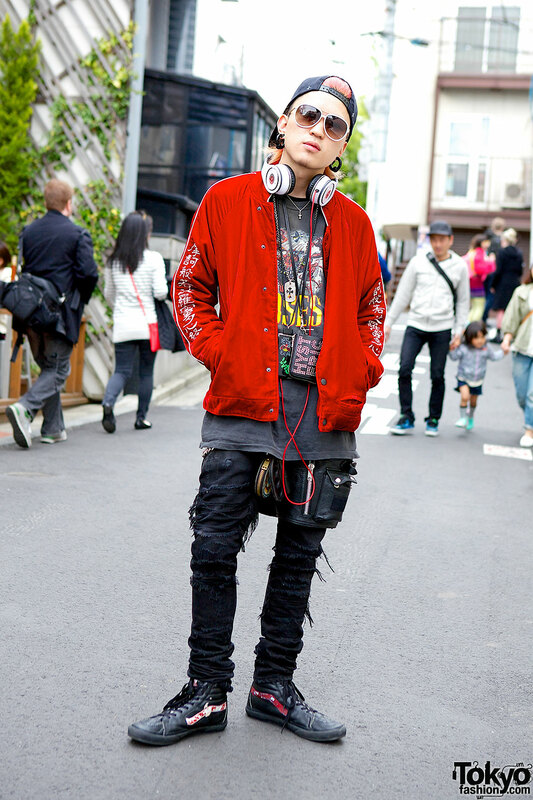 Harajuku stylist in Blackmeans jacket and sunglasses, red jacket and torn jeans. Stylish short-haired Harajuku girl wearing a Fringe Beaded Crop Top, a long skirt, and ribbon-decorated Tokyo Bopper platform shoes.